The CD120b molecule, also known as tumor necrosis factor-receptor 2 (TNF-R2) is a 75 kDa, integral membrane glycoprotein and a member of the tumor necrosis factor (TNF) receptor superfamily. Its extra-membraneous portion shows 4 cysteine-rich domains (CRDs), one of which seems to be required for ligand binding. The CD120b molecule is a receptor for TNF-α. Lymphotoxin-α (LTα), also known as TNF-β when secreted as a soluble homotrimer, as well as the membrane-associated LTα2/β1 heterotrimer. Soluble TNF resulting from cleavage of membrane TNF by the TNF-α converting enzyme (TACE) can also bind to the CD120b receptor. From a functional perspective, signaling by TNF receptor family requires clustering of 3 receptors by trimeric ligands and subsequent association of the intracellular tails with transduction factors, like the TNF receptor-associated factors (TRAF). TNF-R2 triggering can lead to NF-κB activation, but does not result in cell death. However, the most effective cell killing occurs when membrane bound TNF crosslinks both CD120a and CD120b receptors. 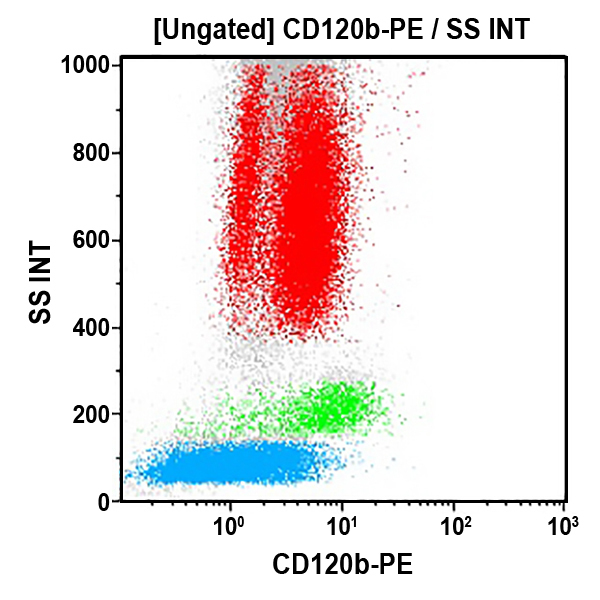 The CD120b molecule (TNF-R2) is restricted to hematopoietic cells. It is expressed on monocytes, neutrophils, NK cells and dendritic cells, as well as on a subset of T cells. Very weak expression can be seen on some B cells, and no expression is reported on basophils.